Maggie J. Lunday Jackson, 46, of Liberty, MO, passed away on January 21st, 2019. A celebration of life will be held at the Carnegie Library, 117 S. 17th, Parsons, KS on Mar. 30 from 1-4pm. This will be a traditional celebration. A 2nd celebration will be held at the Belvoir Winery, 1325 Odd Fellows Road, Liberty, MO on Apr. 13 from 1-4pm. Maggie had requested that this celebration to be a costume party. You can keep your costume as simple or as elaborate as you wish! Just keep in mind there will be children also attending so keep it PG. The family requests in lieu of flowers, please donate to Pancreatic Cancer Action Network at pancan.org/donate. There are no words that can begin to describe Maggie Jackson – energetic, unreserved, passionate, advocate……unicorn. Everything Maggie did, she put her heart and soul into. She served in the US Army Reserves as an Administrative Specialist for 8 years. Her job title was clerk typist but she did much more than that. She received the Army Achievement Medal for meritorious service in command logistics and readiness for the food service program for the entire unit. She was proud of her accomplishments which included being an expert marksman with an M-16 and service ribbons for service from 1990-1998. She earned her Bachelor of Science in Education from Pittsburgh State University and her Master’s of Science in Library and Information Sciences from the University of Central Missouri. Maggie was a natural teacher. She homeschooled for 20 years in an unwavering “Kids First” style. Her top priority was her children and she continually looked for ways to enrich their studies, help them think for themselves and prepare for the real world. All three children, Joseph, Timothy and Brooke graduated from Freedom High Academy under the tutelage of Maggie Jackson. Her dedication to learning and young people carried over into her scout activities as a leader, mentor and volunteer with the Heart of America council for the Boy Scouts and with her daughter’s troop in the Girls Scouts. She not only raised two Eagles and a Gold Award recipient in Girl Scouts, she also worked with all three in Venturing. 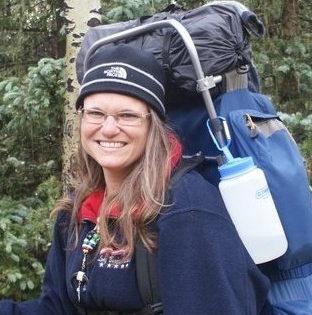 She volunteered as a Venturing Round Table Commissioner for Northstar District, she taught at Bartle in the adult leader program and was a master trainer for Leave No Trace. For someone who taught “Leave No Trace,” Maggie certainly left her mark on the world. Maggie’s love of books and libraries rivaled that of Ben Franklin but she was more than a reader and writer – she was a storyteller. Anytime spent with Maggie was time spent laughing and sharing. She had a story for everything and she had the best stories. Her job at Mid-Continent public library in outreach and community programming was complicated. She made it look easy. She loved it and she was beloved by library staff and customers alike. Working at the library was more than just a job for her, it was her passion since childhood, her true calling. Maggie was known for her smile, her style and the way she met everyone exactly where they were. She leaves behind her husband Charles Jackson, two sons Timothy and Joseph and a daughter Brooke Jackson, and family cats Goldie and Midnight. She is survived by her parents Kenneth and Shirley Lunday of Parsons, Kansas, her two younger sisters, Sarah and Mary, and their families. Pancreatic cancer was not a story that Maggie wanted to tell. But darn if she didn’t tell it her own way. She battled the cancer the way she did everything – with fearlessness, strength, and unending hope for a miracle. She refused to let illness define her life – in true Maggie style, she sought to inspire others through her writing. Her blog, Maggz on Morphine, brought hope and comfort to many as she made her journey through cancer. As a fellow pitcher and knowing the influence Maggie and her family had on the Liberty Horseshoe Club, I wish to congratulate the family for being willing to share such a great member with the rest of us. I know you have and have had your down moments with Maggie no longer being here but enjoy the "story she is telling" about you and what you mean to her as she watches over all of you. Words cannot express how sorry I am for your loss, and how I had hoped and prayed Maggie would be the first to beat this horrible disease. She was one of the strongest and most inspiring people I have ever known, right through the last time I visited her in December at Liberty Hospital while she was receiving a blood transfusion. I am grateful and blessed to have known Maggie, as we all are. I know the angels must be welcoming her with open arms.